A power-packed first half display from All-Ireland champions Tyrone was enough for them to send Louth packing in their SFC first round qualifier replay at Omagh, as Mickey Harte's men pulled through on a 1-12 to 1-07 scoreline. A seventh-minute goal from Enda McGinley set the Red Hands on their way to a 1-10 to 0-03 interval lead, although injuries to Collie Holmes and Conor Gormley brought them back down to earth. Points from Mark Brennan and Aaron Hoey rattled the hosts, who then lost wing forward Ryan Mellon to a second yellow card (55 minutes). Paddy Keenan's deflected goal, three minutes later, squeezed Louth to within four points but the returning Colm McCullagh replied with his fifth point of the afternoon to guarantee Tyrone's passage through. The hosts rekindled some of their 2005 form when they struck a mammoth 1-07 in between Louth's first and second points during the opening half. Newry Town soccer star McCullagh flashed over a point on the run and a fisted goal from McGinley, who got himself into an unmarked position with only Louth stopper Stuart Reynolds to beat, confirmed Tyrone's early dominance. Points from Owen Mulligan (0-02), Sean Cavanagh, Martin Penrose and McCullagh again pushed Harte's side 1-06 to 0-01 in front in a stunningly clinical display. However, injuries to Holmes (knee) and Gormley (concussion) rocked the hosts back onto the heels. Gormley came off worse in a clash of heads with a team mate. Mellon raised a further white flag for Tyrone before Darren Clarke arrowed over his second point for Louth - 22 minutes into the tie. A Mark Stanfield '45 gave Louth their third point in injury time, but by that time, McCullagh (0-02) and Mellon had pointed again. Indeed, the move preceding Stanfield's score should have been a Louth goal but Ray Finnegan's shot was saved by the feet of Tyrone keeper John Devine. 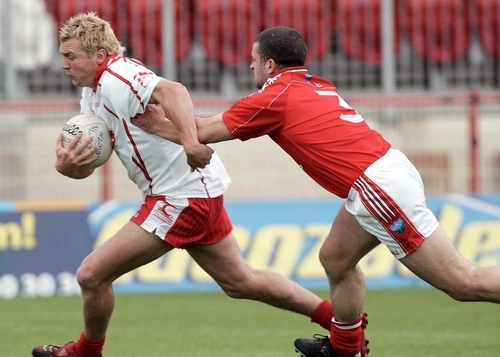 Tough-tackling Louth upped the ante in the early part of the second half. Three points on the bounce from Brennan, substitute Hoey and Stanfield pushed them back within seven points - 0-06 to 1-10 - after 42 minutes. Penrose and Hoey then exchanged points before Mellon was dismissed for his second bookable offence, and Louth were in with a shot with a quarter of an hour left. Their goal came when substitute Trevor O'Brien sent a high ball into the Tyrone square, Devine claimed it but collided with one of his own players and the lurking Keenan did just enough to sweep the loose ball home. Unfortunately, the Louth charge ran out of steam as a subsequent free from McCullagh killed off the Wee men's comeback hopes. 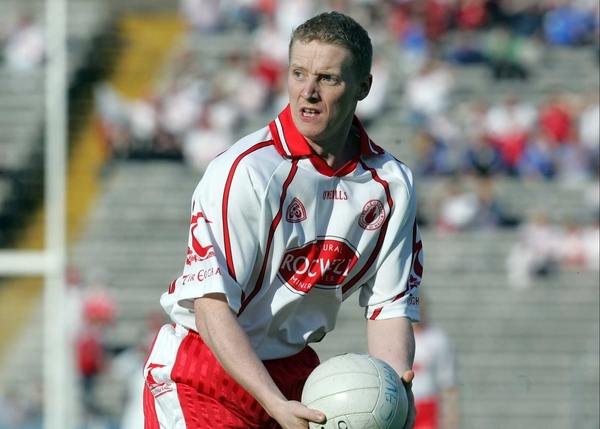 Tyrone: J Devine; R McMenamin, C McGinley, M McGee; D Harte, C Gormley, P Jordan; C Holmes, S Cavanagh (0-01); R Mellon (0-02), R Mulgrew, E McGinley (1-00); M Penrose (0-02), O Mulligan (0-02), C McCullagh (0-05). Louth: S Reynolds; D Brennan, C Goss, J Carr; R Finnegan, P McGinnity, J Neary; M Farrelly, P Keenan (1-00); J O’Brien, M Brennan (0-01), C Grimes; JP Rooney, M Stanfield (0-02), D Clarke (0-02). Subs used: A Hoey (0-02) for Grimes, B White for Neary, T O’Brien for Clarke, A Page for Brennan, M Fanning for Rooney.